Trigano is a European group specialized in leisure vehicles. The company first commercialised camping equipment in 1935, the activity was later extended to the distribution of caravans, followed by motorhomes and mobile homes. 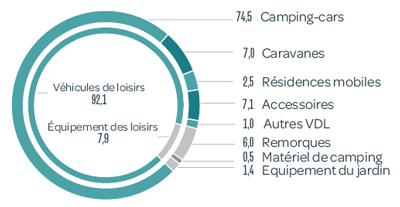 Today, Trigano has two main activities: leisure vehicles (nearly 90% of sales this year) – caravans, motorhomes, mobile homes – and leisure equipment – camping equipment, garden equipment, trailers. Going public in 1998 and then making acquisitions nearly each year, allowed Trigano to be in the European leader rank in leisure vehicles. In 2017, Trigano welcomes four new brands: Auto-Sleepers (English brand of vans and motorhomes), Adria (Slovenian brand of motorhomes, caravans and mobile homes), Sun Living (Slovenian brand of motorhomes) and Hubière (French brand of trailers).